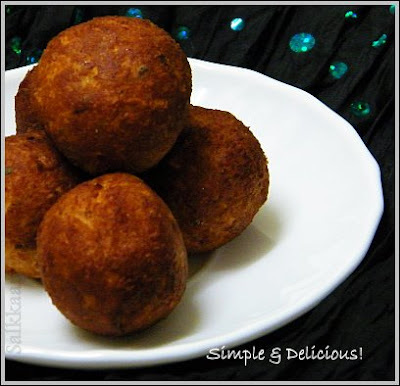 Sweet Bread Balls | Simple and Delicious ! I have met some personalities who do not touch leftovers.. If they are allergic or they have some health problems I would have agreed with them. But they do it for "no reasons"! They think it is Great! There are few others who send the leftovers to the poor neighbours , that too the next day! Recently, my aunt sent an email with the link to the short, 6 minute movie CHICKEN A LA CARTE . (This is produced in 2005). When I saw it, I remembered my blog readers, and thought to inform them about it. I request the readers and other blogger friends to check the link if you haven't seen it before, and show it to your kids! I hope seeing this will encourage everyone to wipe tears of some misfortunate.. And we can thank God for giving us a good life! Crush bread slices and make bread crumbs. Add coconut, sugar and cardamom powder. Mix well , and make small balls. hi seena.. i've tried many of your recipes. All of them came out well. We used to get this snack in our hostel (definitely not exactly like this.. that was authentic hostel version :) ) we call this snack as "bread unda". After seeing this recipe, our hostel memories came into my mind... I'll try this recipe. 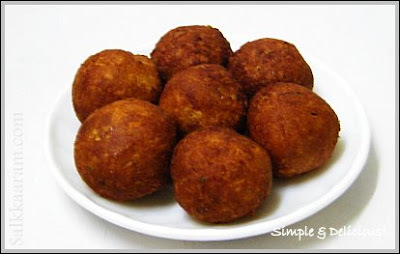 Look like chicken balls. They are sweet balls :) perfect! mmm, looks very perfect and a nice snack... Nice brown color, its tempting me!!! simple to make too!!! I think I saw a similar recipe on some other blog yesterday. I had bookmarked that cuz its so simple! Wow this is an amzing snack! Have never tasted this but I can very well imagine how it would be! Crunchiness of grated coconut, aroma of cardamom and crispness of fried breadcrumbs..yummy! thats a very touching video!! the bread balls look soo golden n crisp!! awesome! Wow this looks so so yumm and the shape of those balls are so perfect too. This is an Excellent website.Keep up the good work. This is an Excellent site.keep up the good work!! This is a very unique recipe. Looks so good. Turned out perfect for u. YUM! Sounds like a great appetizer!